Recently, I went to an opthamologist to get my annual eye exam. I was thinking about how my insurance would cover the cost of new eyeglasses and so my mind began to consider what kind of frames I would like as I sat in the doctor's waiting room. The assistant tested my vision and dilated my pupils and then the doctor came into the darkened room and began to look into my eye. She seemed to linger over my left eye for quite some time and I overheard her say something to the assistant about a hole. After the doctor finished, she turned on the light and pulled her chair up next to me. "You have a small hole in your retina," she said. I felt a cold chill go through my body and I sat in stunned silence. "I'm going to refer you to a specialist and we'll see if we can get you in right away." She went on to tell me that the holes can sometimes lead to a tear in the retina, which causes blindness. I might need laser surgery, she told me. It was a lot to take in. Here I had just been thinking about what eyeglass frames I might get and now I was being told that there was a possibility that I could lose my vision in one eye. She and the assistant left the room and I sat quietly taking in what I had just heard. It reminded me of the day when I learned that my hearing had been impaired drastically by antibiotic ear drops that I had been prescribed. I found myself thinking, "First my hearing and now my vision. It's not fair." The doctor came in and said that I was to drive right over to the specialist's office, and he would see me. The assistant gave me a pair of cardboard sunglasses to protect my still dilated eyes, and I left the office. On the way to the specialist's office, I began to observe my thoughts and feelings and to consider what I believed. I knew that I needed to move away from the fear thoughts and feelings that I was experiencing. I needed to focus on what I wanted rather than the appearances and possibilities that had shaken me in the doctor's office. I began to focus my attention on my eye and to see it healthy. I affirmed aloud that the indwelling presence of God was in all the cells of my body including the cells of my eye. I affirmed that this divine presence was healing the hole in my eye. I kept affirming this all the way over to the other doctor's office. When I arrived, I gave thanks for this healing that was taking place. The specialist dimmed the lights in his office and peered into my eye with his instrument. He spent several minutes examining it. Then he pushed his chair back and began to make notes on his chart. I was quiet during this time, but my heart was racing. "You are a very lucky lady," the doctor said finally. "The kind of hole that you have should heal on its own. He said that 90% of the time, this is what happens. "Others are not so lucky," he added. I let out my breath, which I seemed to have been holding, and tears began to stream down my cheeks. The doctor smiled and handed me a tissue. He said that I should come back in two months so that he could check my eye. On the way home, I felt so grateful for my sight, something that I have always taken for granted in the past. I also realized that I needed to continue to focus on my eye being healed and not see it as damaged. As all metaphysicians know, our thoughts impact our bodies. Science is also proving that as well. I took biofeedback lessons at one point to learn how to stop migraine headaches by increasing the warmth in my hands and feet. I had to think about my hands and feet growing warmer and picture it happening. And it worked. What do you want to see in your future? That is what you should focus on now, at this moment. I grew up with a religious belief system where God, as that supreme being in the clouds, was responsible for all that happened to us. It was very Old Testament. If we were experiencing challenges, it was because God was punishing us. As I explored new belief systems, I encountered the idea that we may not be responsible for what happens to us, but rather how we experience it--the meaning we assign to it and how we choose to respond to it. Victor Frankyl's book, Man's Search for Meaning, was my first encounter with this idea. During his incarceration in a Nazi concentration camp, death and indignities were part of his daily life. Frankyl had the realization that, although he could not change the fact that he was in this situation, he could control how he chose to react to it. He could choose his own behavior and attitude towards it. Frankyl's book changed my life. Later, I found New Thought and Unity and began to read about the "Law of Mind Action" and the "Law of Attraction". I found this to be very empowering and it helped me to see my life from a much higher perspective. It required me to see that I (my subconscious) had drawn to me experiences that reflected my soul's level of overall consciousness as well as those situations that might enable my soul to learn and grow as part of my human experience. It is a hard principle to embrace for most people and I don't think the greater population will accept it. To say that we choose to be molested or to die in a car accident is beyond belief for most people. For me, it took my acceptance of reincarnation to see the bigger picture. If I believed that I lived only one lifetime and then it was over, it would be more difficult to accept this idea. But seeing myself as a soul that has been through many lifetimes gives me a different viewpoint. In seeing the eternal life of my soul, I have accepted that I ultimately have responsibility for what I experience and how I experience it. It is empowering when you look at it. It means that if we create our life experiences, we can choose to create different experiences if we don't like what we see in our past. When we choose to accept this idea of responsibility, it can be easy to start blaming ourselves for what we've experienced. But blaming and punishing ourselves is not the answer. That takes us back to our Old Testament mentality. Jesus spoke often about forgiveness. It was very simple to him...he said, "Go and sin no more." In other words, you've realized your mistake, don't do it again. It is about coming into awareness and growing in consciousness. All this being said, I sometimes would like to feel that there is a protector on a white cloud who will rescue me from some of my antics. When I gave up that idea it was like finding out there was no Santa Claus. But when I accepted the idea that the same Spirit that was within Jesus was also within me, it was powerful. It meant that I was never without God. I didn't have to pray to a God outside of me and hope he would respond. Anyway, that's just a bit of my journey and what I've come to believe. It's obviously something that we each need to make up our minds about. Not long ago I heard about some research that was being done with expectant mothers. It seems that they have found that the thoughts and attitudes that a pregnant mother has will effect the child that she is carrying. If a mother is consistently worried, tense or afraid, she releases cortisol, which is often called the "stress hormone". This cortisol is also shared with the baby. Over time, the baby's body begins to prepare it for stress and it comes into the world with almost an expectancy of anxiety and fear. See how powerful our thoughts are? Not only do they effect us, but also our unborn children. It would seem to make sense that anything we can do to help an expectant mother remain calm and relaxed would be a good thing for both mother and baby. Meditation would be great. But even if you're not a pregnant mother, be aware of the thoughts you are having during the day and the possible effect that those thoughts are having on your body. If you find yourself feeling anxious or stressed and you don't have time to meditate, take a moment to do some deep breathing or do some yoga stretches. And focus on your blessings. That alone will make a noticeable difference. Nick Has No Arms or Legs--What's your problem? Are you having a bad day? Is life getting you down? 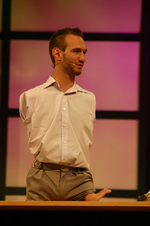 Well, let me tell you about Nick Vujicic. Nick's father was the pastor of a church in Melbourne, Australia. On the day that Nick was born in 1982, his father asked, "If God is a God of love, then why would He let something like this happen?" The whole church mourned on the day of Nick's birth--because Nick was born without arms or legs. It's hard to understand when bad things happen to good people. It's normal to question God and go through the feelings of shock, anger, denial, and bargaining before we move to acceptance. These are all part of the grieving process. But Nick's family did not remain focused on his lack of limbs. They focused on what he had and that was a healthy body in every other way. He was not mentally disabled, as some thought he would be based on his physical disability. While growing up, Nick faced cruel and painful teasing at school by other children, and at times he wanted to end his life. Why was he born the way he was? he asked God. Nick's faith in God, courage and determination more than compensated for his lack of arms and legs. He began to make friends at school and learned to live independently, dressing and feeding himself and using a wheelchair. He also graduated from college. Nick now believes that his lack of arms and legs was not a coincidence or an accident. He sees it as a way to reveal the glory of God working through him. Yes, he prayed for healing, but the healing that occurred was in his attitude and consciousness. He understands that his own challenges have equipped him to help others with their trials and tribulations. Nick is now a motivational speaker, speaking at schools and corporations. His experience of having faced enormous obstacles and the bullying by other children, have enabled him to help many students overcome their challenges and develop the self-confidence and courage to handle difficult situations. A student said to his teacher: "Whatever I do, I am criticized. When I make a mistake, I am told, 'How could you have been so stupid!' When I speak to other people, I am frequently chided, 'You are making a fool of yourself!' When I finally do something right, I hear 'You should have done this a long time ago!' It's torture to be consistently told off and put-down. And this criticism follows me wherever I go...because it is my own inner voice that is doing the criticism." Do you have an inner voice that criticizes and complains every time you do or say something? I have had problems with this. Many of us who grew up with a critical parent tend to continue the role ourselves when we get older. When I start feeling bad about something and say, "I should have known better," or some other self put-down, my husband will ask, "Whose voice is that?" It will strike me that it is one of my parents; that I am repeating something that they have said to me when I was growing up. But we don't have to be self-critical. We can begin to acknowledge ourselves for the good things that we're doing and aplaud our efforts, even if they're not perfect. No one is perfect. Our parents were not perfect either. They thought they were helping us by pointing out to us the error of our ways. Unfortunately, they may not have realized that our egos took the criticism and ran with it. Our identities became linked to the criticism and we started to feel flawed. Unless our parents balanced the critical messages with positive messages, we probably bought in to the idea of us being flawed and low self-esteem resulted. When I was older, I remember being told, "There's nothing wrong with you. God doesn't make junk." That was a relief. If you make a mistake, forgive yourself. We are all evolving souls learning lessons in the classroom called planet earth. When the little voice in the back of your head starts criticizing, just say, "Thank you for sharing." Our underlying beliefs can create problems for us in life. What we believe about life, relationships, money, our bodies, religion...can sabotage our hopes and dreams for happiness. Have you ever stopped to really examine what you believe at the deepest levels of your consciousness? And are those beliefs working for you? If not, you may wish to use the process of "Inquiry" from Byron Katie's "The Work." In my last post we examined our beliefs about another person. Now we will examine a deeply held belief about our life. Here are some examples of possible beliefs that could be sabotaging your happiness: "Life is unfair." "God will punish me if I'm not good." "You can't trust men." Pick a belief that you would like to examine and let's begin using the questioning process and turnaround. The belief that I chose was something that I heard all the time growing up--"I have to struggle and work hard to be prosperous." Is it true? No. The times when the most money has come into my life has been when I did not even work for it. Is it absolutely true? No. How do you react when you think the thought that you have to work hard to be prosperous? I feel tense, nervous, guilty for not working harder, lazy, and not worthy of prosperity. Who or what would you be without the thought that you have to work hard to have prosperity? I would enjoy life more, feel less stressed out. I would not feel guilty when I am taking time to relax. Turnaround: I don't have to struggle and work hard to be prosperous. By now you should have a pretty good idea of "The Work" and how you can apply it to your life. If you have any additional areas that you would like assistance applying it to, please email me and I'll do my best to help. I strongly suggest that you purchase a copy of Byron Katie's book, "Loving What Is." She addresses a lot of ways that it can be used. You may also wish to check out her web site www.thework.com .